Discussion in 'Muppet Appearances' started by Phillip, Nov 25, 2013. 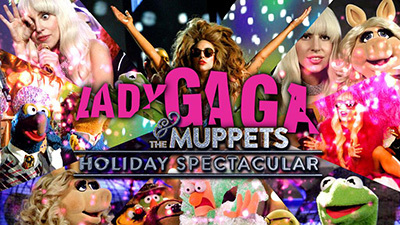 Thanksgiving night, watch the "Lady Gaga and The Muppets Holiday Spectacular" on ABC. The Muppets will ring in the holiday season in this 90-minute special. The special begins at 9:30 eastern, 8:30 central. Find out all about the special here. If you saw the Lady Gaga and the Muppets special, please "like" this message and share your thoughts below. WalterLinz, Mister Muppet, FloydxJanice776 and 21 others like this. Wow. I really never appreciated the fact that holiday specials were scripted until now. We know The Muppets are talented—no argument there. And we know that Lady Gaga is talented—no question about her raw talent. So how can there be just...nothing going on on stage? The interactions between and among the actors were amazing stiff and awkward--the only exception was "Baby It's Cold Outside." This was just...odd. Weird and disjointed and totally like The Muppets and Lady Gaga have nothing at all in common. Nothing. (Well, maybe Beauregard, who likes both of them.) And the songs, while interesting to watch, were just sort of strung together with no introduction. The Muppets participation in the songs was irrelevant—they added nothing. They weren't bad or embarrassing or anything—they just didn't have any more to do with the song or with LG than a fan dancing in their own living room in front of the television. The could have been smurfs or minions or little ponies for all the uniqueness they brought to the song. There was a huge missed opportunity here—two of the world's biggest divas are in the same room, on the same special and we got over halfway into the show before they even interacted. In the first scene together, other than an off-hand “Oh, hello Piggy,” Gaga didn't acknowledge that Piggy was even there. Let's be blunt—there isn't a diva in the world who hasn't channeled Miss Piggy at one time or another—and to waste this opportunity to have two larger-than-life superstars who could be playing off each other, singing with/against each other—it's just flat out a travesty. I'm hoping that this isn't an indication of the reboot of The Muppets franchise. It's unworthy of them. The duet: Kermit should not be talking about how big the stage is, then how small the world is. His ad-libbing—and I am assuming that it's adlibbed because it would be embarrassing if this were scripted and were still this lame—was neither unique or interesting. And Kermit is singing “Gypsy” instead of Piggy? Couldn't Piggy have come out dressed in something old-style gypsy—scarves and gold hoop earrings, etc., and then, when they correct her mistake, transform into an incredible big-haired show-stopper to sing along with Gaga? Really? When Kermit sang, “I don't want to be alone forever”--no Piggy arrived at his side as though beckoned? And she wasn't there to sing, “I can't be denied.” This could have been an amazing part of the show with this song—it is a song that would have worked remarkably well. The Muppets know—as well as any performer anywhere—that the life of an entertainer is often a life on the road, with holiday in hotels and filming schedules that keep you from spending time with family. This could have been a poignant song, a moving song—but Kermit just chuckled his way through the whole thing like a total goofball. I am at a loss to explain it. I am just...wow, totally sad and bummed by the mess this special was. I cannot believe I'm saying this—truly I can't—but I liked Gaga better impromptu in the Kermit-dress—it was at least unexpected and interesting. Bring back Cirque du soLamé. And while you're at it, please bring back The Muppets—the real muppets, please. LaniArianna, Muppet fan 123, Plushie Coture and 4 others like this. Lips got decent screen time due to poor camera work. And seeing Mo Frackle again was nice. Poor Walter barely got any time. Rizzo complaining about how he hasn't gotten a name drop in years was a riot. That wasn't too bad. The musical numbers were fine; "Venus" seemed like something MT! would've done, until everyone but Mayhem left. Most of the backstage scenes seemed very awkward, like there was barely even a script. But, hey, some funny Zoot lines, Big Mean Carl and Piggy not being a complete b-*-t-c-h is cool. And Rizzo! Yay! Very well said and spot on. Amazing how bad this was. It's Gaga's first Christmas special, give her a break. Although, the Muppets coming onstage to say hi to Elton like old friends would have been cool. Ummm. Actually it's her second holiday special. It felt too much like New Year's Rocking Eve with Lady Gaga and Muppet bumpers thrown in. It just didn't gel. Probably quite a good thing that I missed out on watching it. Muppet Master and MelissaY1 like this. THIS MADE NO SENSE AT ALL! I think Lady Gaga was lying on her couch as her agents listened to her babble: "What if I made a special and the Muppets are in it as if I was their guest"
And that's precisely what she got. A special with the Muppets in it. Nothing else!!! No script, no sequence...no logic...NOTHING! 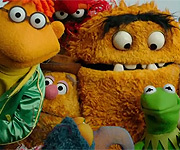 The Muppets were GREAT in the Gaga special!!! They've got a new movie coming out soon that looks and sounds amazing. If small potatoes things like this don't come out perfect, whatever. We've got a great new movie to look forward to and things like this aren't gonna stop it. Muppet Master, Muppet fan 123, JonnyBMuppetMan and 4 others like this. This special was a lot better than I was hoping. So most of the non-Muppet portions weren't that good, and I feel like some of the songs (even Kermit and Lady Gaga's duet) were just too long. But this is not the worst special the Muppets have ever done. I think it's better than The Muppets Go Hollywood, Rocky Mountain Holiday, The Fantastic Miss Piggy Show (though those are specials I don't see as the best), and the Studio DC specials. Christmas photos, including photos from The Muppet Christmas Carol and A Muppet Family Christmas. It was so great to see Lips, Carl, and Mo Frackle in this special. Too bad more obscure characters weren't in it. 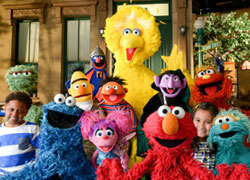 It would have been great if they'd at least put the full-body monsters in the numbers that didn't have Muppets. The montage bits with the characters were good, but they also feel like stuff that could have been videos at muppets.com. This special should have had more numbers like the opening number, the Animal/Beaker/Swedish Chef numbers, and Santa Baby (third time Miss Piggy has sung that) and less numbers that look like live concert footage. I was expecting the sneak peek at Muppets Most Wanted to be a full clip as opposed to the trailer, which didn't have much we haven't already seen (just the part with Dominique claiming that Kermit now has a cold). I can't believe that they put an outtake of the introduction in the credits. I would have thought that intro would be separate from the special (I doubt it'll be included in reruns or the DVD release, if this special does get a DVD release). The first scene that was shown online, which we all thought was boring, ended up a lot better than what was previously shown. One thing I noticed is that it seems RuPaul was left out of the promotions. Not knowing what she looked like, when I saw the promo and the part where they mention Lady Gaga singing with the biggest name in music, referring to Kermit, I thought that clip was of Kermit with RuPaul (didn't realize it was Gaga). And in the promo I had to rewatch several times to understand what the announcer said when he said she would perform with "him" (Kermit). I still don't know if RuPaul is a male or female, I thought it was a male drag queen (are there women who are drag queens), but I felt she looked like a natural woman as opposed to a man in drag. It is a little weird that Lips wasn't with the Electric Mayhem in the opening number, but was in all those montages. So is this special not owned by Disney? I didn't notice any logos for Disney or any Disney-owned company (that I know of.... I'd never heard of the company that gets a logo card). This was...okay. Clearly it was all about Gaga's new album, and the various guest stars were there for cross-promotion. Is that the correct term? You know what I mean. Like Ru, I was disappointed with how Piggy was treated. I was hoping for a battle of the platinum-wigged divas. Instead, in her first sequence Piggy was treated as furniture. Huh?? I'm not one of Piggy's Little Piglets, but I don't think that's how she should be treated. As for the rest...well, yeah, it was kinda thrown together. And it's embarrassing how stilted a lot of the bits were. The liveliest footage came from the end, when they showed the outtakes. Lastly, did they pack Gonzo face down? His nose was weirdly mashed to the side. Made his face look out of kilter. Well, it was better than watching grainy, depressing footage of foreign wars. Pig's Laundry and Muppet fan 123 like this. I thought the special was great, personally. This special was really... meh. I'm sorry, but I got really bored with the special. It seemed like the holiday aspect of the whole special took a serious backseat for the whole show, it was more like a Lady Gaga plugging her new album special, with only a holiday song thrown in here and there. As for the Muppets... they seemed to lack energy and charisma in their performances tonight, I wasn't feelin' it... even Statler and Waldorf seemed tired and listless. Admittedly, those bit with The Leprechaun Bros. were really amusing, and Piggy probably delivered what's now my favorite rendition of "Santa Baby" (heck, maybe the ONLY rendition of "Santa Baby" I actually like, ha)... other than that. Gaga can't act. I'm sorry, but it's clear that she's not an actor, she fumbled and stumbled with her lines a lot (and actually, Kermit did too in their scenes together, unless that was intentional, it still seemed really awkward). The new Bobo puppet is pretty creepy... the way his snoot seemed to move independently was kinda freakin'... and when did Swedish Chef get married? Again, the special as a whole was just rather boring. In addition to the holiday aspect, the Muppets also kind of took a back seat throughout the show as well, which Piggy kind of lampshades towards the end. They really shouldn't have filmed this widescreen then try to present it in 4:3. And what purpose did Kristen Bell actually serve in this special? Just to be a pretty Mary Sue? I agree with others in that hey, Rizzo got some more screentime that has sorely been missed lately. Overall... I wouldn't kill to see this again. Oh, and one last observation... anyone else besides me think Walter overdoes it on the facial expressions just a little bit? ... Just a LITTLE bit? So, I missed the first 30 minutes because I was watching Glee, but I did enjoy what I saw. I do admit that there should've been more Muppet stuff and less commercials. The commercials were like 5 minute long. Or am I just over-analyzing things? For me, it was all about Lady Gaga. I was bored when her songs played. The only parts that interested me were the parts the Muppets were part of, my favorites were the audition and where Miss Piggy attempted to sing "Santa Baby" but the backup singers overshadowed her. Those were pretty funny. I really wished the Muppets should have been involved more, especially Walter and have more christmas songs than what Miss Piggy sang and the trio Swedish Chef, Animal and Beaker did. Overall, other than the parts with the Muppets, I was bored with it. I don't think it's the worst Muppet related special, but it was boring when Lady Gaga and other guests came on with her. I don't think I'd watch it again. Thank you for your bright spot of optimism. I love The Muppets and I hope they have a great new movie.